This has been an introspective week for me. I have a tendency to live in the present which may be healthy for some; however, for me, it often means I am avoiding issues of the past and future. Being honest about situations which are deeply rooted in anger and resentment can be cathartic and healing. Maybe it is the changing season which has prompted this awareness. More likely, the truth is simply overdue. This truth can be bitter or sour and hard to swallow. With time, attention, and hope, something beautiful may emerge. 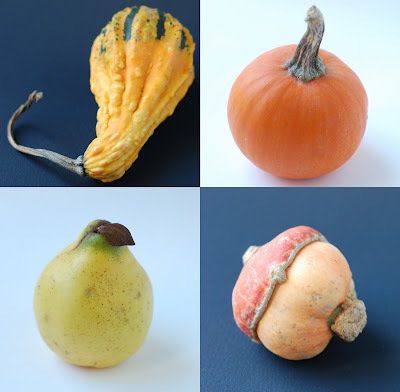 I received a generous gift of local quinces from my friend Anya yesterday. 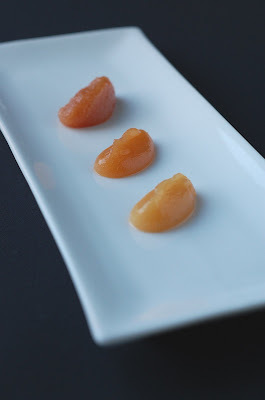 Although I have never worked with quince before, I have always been curious about this aromatic golden fruit, hearing stories about its mellow transformation from acidic and astringent to pink and delicious when cooked. Following this recipe, five pounds of quince became a sweet fragrant purée, half of which will be saved for a rainy day and the other half cooked down to make quince paste (a.k.a. 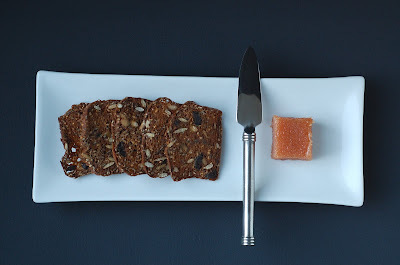 membrillo). After not eating a single morsel of turkey for Thanksgiving, I think that avian karma subconsciously led me to several bird habitats this week. 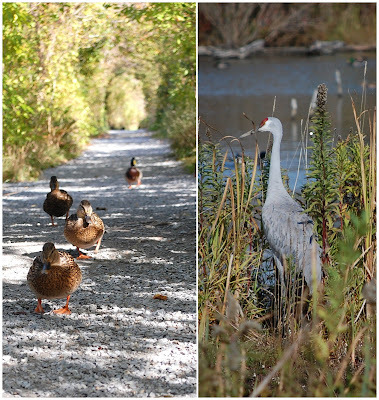 The annual snow geese migration attracted Eric and I to the Reifel Bird Sanctuary in Ladner and we were audience to numerous Sandhill cranes, American coots, Northern pintails and an army of Mallard ducks. 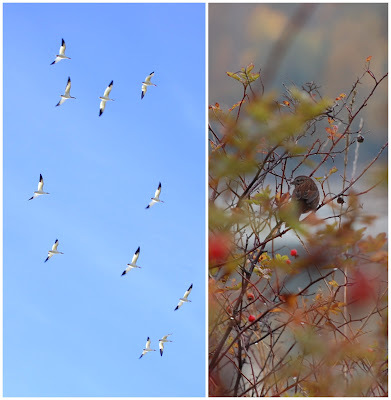 Then, my friend Fionna and I headed out on a chilly Sunday morning in search of fall colours to photograph but I found birds instead. Speaking of birds, my sister is nesting once again after a stork delivered my newest niece into the world on my birthday last Wednesday! Happy Birthday Hayley (aka Bean)! Happy Thanksgiving to my fellow Canadians! Autumn has definitely arrived in Vancouver with the return of rain and chilly mornings at the bus stop. We turned on the heater this weekend and dug out the wooly throw blanket that goes on the couch. The garden needs to be cleaned out and spring bulbs need planting but I am waiting for less soggy weather before venturing out. Here on the west coast, there are no truly spectacular fall colours to brag about; we are lucky to enjoy the green coastal coniferous rainforest all year round. The one current exception is my fiery lipstick red Japanese maple which graces my patio. Its lacey crimson foliage is something I look forward to every year. The local British Columbia apple harvest is also in high gear. 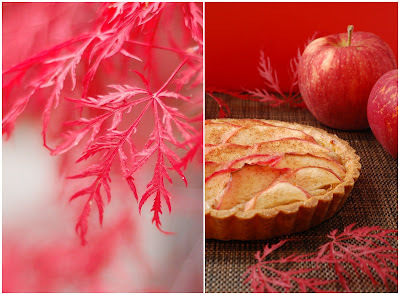 Although my preferred method of apple consumption is raw, cold, and crisp, the baked, warm, and tender apple in tart or pie form is always a treat. This small and simple French apple tart helped use up the last Royal Gala in the fridge and will go nicely with my roast chicken at tonight's Thanksgiving dinner for two. Stay tuned for more apple related activities as I will be heading to the UBC Apple Festival next weekend! See you at the tasting tent? 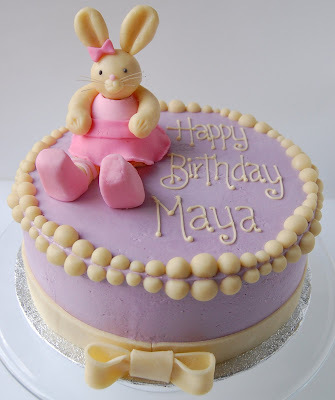 Having accumulated an abundance of egg whites during the big wedding cake production, I was happy to receive a request for a small ballerina-themed birthday cake for a lucky little girl named Maya. Using up egg whites is always a goal in any pastry kitchen and for me, I can only eat so much Chinese egg-drop corn soup. So, this cake was a perfect opportunity to make passionfruit Italian buttercream, combined with some local raspberries I had frozen from the summer, and served between three layers of chocolatey Devil's Food cake. Having a bunny be the ballerina was my idea, based on a favourite toy from my childhood. Plus, putting animals in clothes onto cakes seems to exponentially increase the cuteness factor every time. The bunny was shaped from white chocolate modelling paste and her pink outfit was tailored from pink rolled fondant. Eric noticed that the bunny ballerina's face does have an odd resemblance to Hello Kitty, which was quite unintentional. 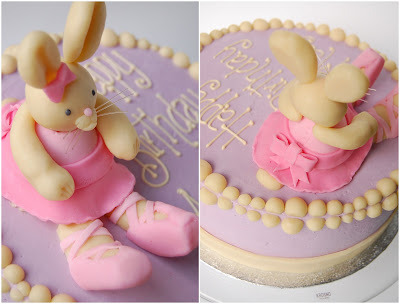 My favourite details on this cake were the ballet pointe shoes and the back of the bunny's dress. In fact, even though I had made a perfectly round bunny's tail, I became so caught up in making the sash and bow that I forgot about it and ended up tucking her tail under the skirt instead. Happy Birthday Maya!